Examinations For Failed Sports To Reveal Where We Went Wrong! Are we really up to standard in the sporting world (except for our national sevens team and weight lifters)? How far can we say, with all honesty, have we come in the different sports? In truth, some of our sports have never improved, be it the Commonwealth Games, Pacific Games or a re­gional meet. In some instances, you will hear our athletes or swim­mers clocking their personal best times. What they do not understand is that PB does not qual­ify you for a medal. So, as the saying goes, the Commonwealth Games have come and gone and it’s back to the drawing board to see where we went wrong and get it ironed out be­fore the next big games. But guess what – it does not happen and PB once again rears its head. Can someone be brave enough to call a spoon a spoon and honestly say where we are going wrong? Sports were given $6.7 million by Government in the 2017-2018 Budget, with a view that this would help raise our sporting standards to new levels. Plus the money and opportunities some sports get through sup­port from their world bodies. What have we got to show for it after sending such a big contingent of competitors and officials to the Com­monwealth Games: one gold, one silver and two bronze medals. Something is definitely wrong and it could be ath­letes in some sports probably looked at the Common­wealth Games on Gold Coast as a trip rather than a sporting competition. This you would expect from contingents in the past but with Government’s ever growing interest in sports (and it is thanks to a small group of people who have raised Fiji’s name) one would expect individual sports to improve. It’s either we have lost the plot in being competitive in different sports or we are not getting the right people into key positions in some of the sporting bodies. 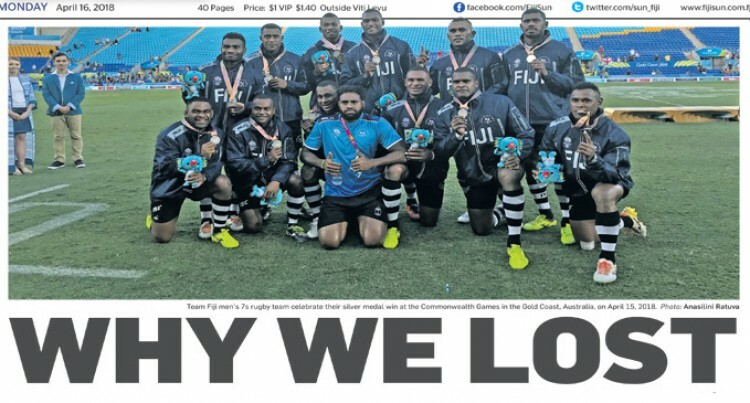 Why can’t we adopt the same attitude and focus as our Fiji Airways Fijian Sevens team. Look at netball and the loss it incurred at the games and against teams we had beaten before. Our analysis report noted this – 5 Games, 5 Losses at the 2018 Commonwealth Games. Fans were seriously disappointed and deservedly so for the Fijian Pearls winless show to date. Our national netball team are on a downward slide despite all the opportunities they have had. Are the players and coach the only ones at fault here? Fiji always backs the Fiji Pearls being our one and only national netball team, but when they continue to be outsmarted, and outperformed, there is an urgent need to fix something. Definitely something is not right and way out of or­der on the direction Fiji Netball is heading. Our best ranking was 6th and that was 19 years ago and we managed to stay in the top 10 before the slump began and we are currently ranked 12th. We thought we prepared well for the Commonwealth Games with a coach of Vicki Wilson’s calibre in charge. We thought we had the international exposure need­ed with the build up but nah – not to be. What happened to the swimmers, track and field ath­letes, and other sporting bodies like squash and bad­minton? Fiji will continue to “make up the numbers” rather than be a feared nation in the sporting arena if we do not revamp some sporting bodies. We have to start somewhere. The National Sports Commission might be a good leader in this. Each failing sport needs to be dissected and a full post-mortem examination done to determine the cause of non-performance. Let us end the PB era and begin the medal era. Let us emulate what our sevens heroes have done for us. Let us learn from Eileen Cikamatana and her com­mitment and dedication that earned her a gold medal. Let us start making that change now or lo and behold, we will continue to be just another nation competing in some sports with no real intention of winning a medal.